You know those days when you're in a rush and you want something you can throw on and still look polished and put-together? This is the perfect dress! This dress is perfect to have on hand for nearly any occasion. The Always There For You Belted Dress is fully lined and made of a versatile cotton blend fabric. 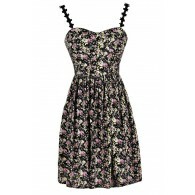 It has wide shoulder straps, a rounded neckline, and a flowy cut. The best part of this dress has to be the included braided belt that wraps around the waist, adding contrast to this look. The Always There For You Belted Dress has a flattering shape that looks great on nearly everyone. Pair this dress with flat beaded sandals on casual days when you're out running errands. Dress it up with brown wedges or heels for dinner and drinks. Pair this dress with brown cowboy boots for a country concert. This dress is the perfect new addition to your wardrobe! Details: Fully lined. Belt included. 70% cotton, 30% rayon. Lining: 100% polyester. Hand wash cold water separately. Color will bleed. No bleach. Hang to dry. Small measurements: Length from top of shoulder to hemline: 33". Bust: 34". 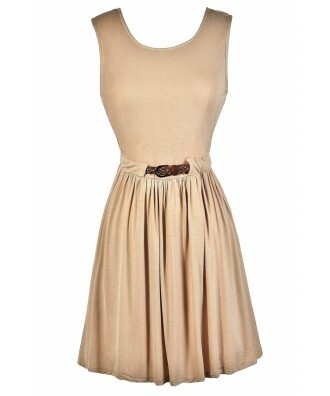 You have added Always There For You Belted Dress in Taupe into Wishlist. You have added Always There For You Belted Dress in Taupe for Stock Notification. 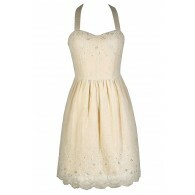 You have set Always There For You Belted Dress in Taupe as a loved product. You have removed Always There For You Belted Dress in Taupe as a loved product.